Cohabitation agreements do not exist in Turkey; there is no judicial ground for them. So what happens about these kinds of agreements in Turkey, which do exist in most Western-European countries? What are the rights of a remaining partner? These are interesting questions for people who share real estate in Turkey without being married. Even more so if the rights of the remaining partner are not assured in a will. If your'marriage' is based on a cohabitation agreement and you share a house in Turkey, I would recommend you both secure your legal property tenure relating to inheritance issues with a notarised will. Because cohabitation agreements are not legally recognised in Turkey, a remaining partner will not be entitled to claim an inheritance based on it. By Turkish law only a married partner will be recognised as a legal heir. This explains the need to create a notarised will, preferably in Turkey, for the other partner in these situations. A remaining partner can obtain testamentary heir ship based on a notarised will. This means he or she can request a right to inherit based on the will, with the relevant Turkish authorities, i.e. the magistrate. A will registered abroad is equally valid legally as one registered in Turkey, but a will created in a foreign language will more likely create bureaucratic problems and with it often comes an unnecessary waste of time and money. It seems also a wise move to register the other partner's right to usufruct the real estate at the local Tapu- office. This way the remaining partner has the right to remain in the property without being confronted by succession problems. Be alert and don't leave it too late to take legal advice regarding inheritance issues of your property in Turkey. Many disappointed buyers pass through my office. My first question is always, whether a notarial purchase agreement was signed. Usually this is not the case, as people find the notarial costs too high. And although it isn't compulsory under Turkish law to sign a purchase agreement through a notary, it is beneficial to do so, particularly in such situations as those mentioned above. It is advisable to have a notarial purchase agreement when purchasing a property from a building firm or a contractor. In this case the purchaser is called 'consumer' as referred to in the Consumer Legislation and enjoys full protection underthe Law. Here follows in a nutshell an important part of the content. According to Consumer Legislation a property is 'defective' if it doesn't fulfil one or more criteria or qualities promised by the contractor in, for example, the brochure and/or the advert. The brochure could for example mention that the property has a generator for the entire building, but at the time of delivery it's not there. The same is true for properties that are subject to legal, economic or technical failure. According to the law; the sold property has to comply with the purchaser's expectations raised by the seller. If the purchaser finds faults, he is entitled to inform the seller in writing within 30 days after delivery, by way of a formal letter of notice. I would like to inform you that in Turkey a formal letter of notice or reminder has to be sent through a notary, as a copy of the content the letter has to be filed with the notary as evidence. According to Consumer Legislation, the purchaser-consumer has various options. By cancelling the purchase agreement he can claim back the purchase amount, he can opt to have the faults repaired or to replace the property by another property. The purchaser also has the option to request a reduction in price pro rata the fault. And finally, for any damage incurred, reasonable damage compensation can be claimed. The selling contractor has to respect the choice of the purchaser-consumer. In the event the selling party doesn't respect the request of the consumer-purchaser, the consumer-purchaser has the option to take the case to court or to file a complaint with the College of Consumer Rights. Almost every city has a College of Consumer Rights, which is often housed in the premises of the local Chamber of Commerce. The decision of the College concerning disputes is final for all parties. In short; Make sure that you get proper advice before you purchase a property. If you decide to purchase a new development, it is advisable to always have a notarial agreement with the contractor so that you will enjoy all the benefits offered by the Consumer Legislation. Sooner or later all foreigners owning an apartment in Turkey will have to face it: The Owner's Association. The Owner's Association (Kat Malikleri Kurulu) is an administrative entity which has its legal foundation in the Apartment Rights Act also called the Apartment Regulations. The Association's objective is to manage and keep in good repair a building that consists of private and communal property components according to the Apartments Regulations. The Apartment Regulations also apply to private dwellings belonging to a project style residential park. It is important not to confuse this type of association with associations based on the Turkish Association Act, the so called Dernek. A lot could be written about the Owner's Association but I will limit this story to a number of amendments to the Apartment Regulations which were introduced on 14 November 2007. 1. A finished apartment building which is divided into private ownership units has to be transformed into housing units and has to be registered at the Tapu office as 'dwelling' (= kat mülkiyet) within 1 year of receipt of an ISKAN, also called yapı kullanım izni, under penalty of a fine for the entire building. Every member of the Owner's Association must carry out the necessary actions and payments at the request of the administrator or one of the apartment's owners to enable the board of the association to complete registration at the Tapu office. Uncooperative apartment owners risk fines of 1000 YTL per apartment he owns. 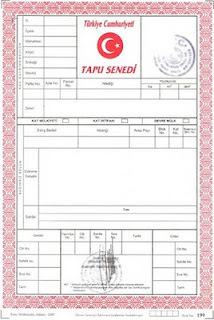 The clerk at the Tapu office will send a copy of the new Tapu certificate to every apartment owner after the building has been registered as 'housing units' (kat mülkiyet). This makes very-little legal difference to the owners but they will have to pay more property tax to the Municipality. 2. Another important and fundamental change relates to apartment owners who don't pay maintenance money in time, don't pay at all, don't behave appropriately or don't comply with the association's administrative rules. Legislation has tightened regulations regarding owners who misbehave or deliberately refuse to pay maintenance money and has improved opportunities to take legal action against these owners. It is now less problematic to publicly sell the apartment of a misbehaving owner by intervention of a judge. 3. The previous Apartment Regulations did not include the possibility of establishing an Owner's Association for dwellings in residential housing parks that are part of one project but are legally situated on separate lots and sections. Lack of jurisdiction regarding this created practical problems such as not being able to collect maintenance money. The current changes enable owners of houses or buildings on separate lots and sections to join in one Owner's Association. I think this is a welcome relief for residential parks in particular. 4. The last notable change relates to building projects of several apartment buildings or several residential parks on separate lots and sections. Legislation not only provides for the administration of Owner's Associations for the same building but also for different types of administration such as administration per island (ada) and administration per several buildings (toplu yapı). These types of administrations must communicate and act according to the legislation. A general members meeting per ada and per toplu yapı must be held biannually. Not a lot has been written about this subject yet; nevertheless it is very important for everybody who is buying real estate in Turkey. I strongly recommend reading this article carefully if you sold a property with profit in the last year. In this case it is very likely that you are obliged to fill in a Capital Gains Tax return form in March 2011. This Capital Gains Tax only applies to profit made from selling real estate, in Turkish: 'değer artış kazancı'. The tax will be calculated dependant on the tax return form you submit. The tax service will not automatically contact you for this; it is your responsibility to submit the form. So what if you don't? As long as you don't get caught, very little will happen; however the tax services can penalise you up to five years in retrospect for not submitting the Capital Gains Tax forms and demand the tax still be paid with interest. For your information: penalties and reclamation interests as applied by the tax services are exorbitant in Turkey. You are obliged to report the profit of selling a property within five years of purchasing it (for homes purchased before 2007 this is four years) to the local tax office; you will be charged Capital Gains Tax if the profit exceeds a tax exempt threshold set by the government, in 2010 this was 7,700.- TL. 3) the total profit exceeds the tax exempt threshold for each calendar year; the threshold is set separately for each year. You are obliged to report the amount by which the threshold is exceeded by submitting a form (Turkish: 'beyanname') at the local tax office. In case of more than one property sale within one calendar year, the total amount to exceed the threshold must be reported. The profit is calculated by subtracting the purchase price (as registered at the TAPU office) from the sale price. The tax return must be done by March of the following calendar year. The Capital Gains Tax should not be confused with the local council real estate tax. The limitation for Capital Gains Tax is five years from the date of purchase, as registered by the TAPU office, for selling private properties. In effect property sold in 2004 can no longer be taxed for Capital Gains Tax; there is however no limitation for local council real estate tax. Both the buyer and the seller are individually liable for paying the local duties. In case a seller is not private but acts on behalf of a company, corporate tax of 20% will be due on the invoiced amount of profit (the difference between the registered amount of purchase and the invoiced selling price); and of course the invoiced VAT is due. It is self-explanatory that all companies must invoice the sale of a property. There is not tax exempt threshold or limitation for companies. Incredible, yesterday one of my customers came to me and said, that his accountant told him, that you need at least 50.000 US dollars and a Turkish partner to setup a new business in Turkey. That changed in 2003. All regulations now are the same as for Turkish Nationalities. No need for 50.000 dollar no need for a Turkish Partner. But why told his accountant 2011, the old regulations. The answer is quite simple. There are a lot of Accountants and Notary in Turkey which are not up to date with the new regulations. Due to the fact that they do not setup a company for foreign nationalities. Setting up new companies (with foreign partners) or advising in setting up joint ventures are one of their expertise areas. You can read more on their website or business publications. Selma Ören M.A, lawyer Turkish law, writes a column on a subject that reflects buying or owning real estate in Turkey. Every week we receive questions from readers that are also answered by Selma Ören M.A. Because other readers might have the same problems, we have collected some popular questions and answers and published them in this issue. Please can you explain who is responsible for the annual maintenance fees of unsold apartments in a block? If 20 of the total 35 apartments in the block are sold, should the maintenance fees be divided by 35 or by 20? In other words, are the 20 owners responsible for the entire block? And if not, who is responsible for the 15 unsold properties? Every owner of real estate (in this case apartment) is responsible for the (payment of) maintenance fees for his share in the total block. The person who or the company (for example the developer) that owns the unsold part or parts of the block, is responsible for the maintenance fees. I would appreciate your advice on the following situation. In February 2007 I bought an apartment under construction. I didn't sign a solicitor's purchase agreement as I trusted the real estate agent. With the real estate agent I also agreed to withhold the last 10% from the developer. (I had already paid the total amount to the real estate agent). A year later the property was finished, but to a very low standard (doors, floors, etc). It looked a bit like a cowboy job. Many emails, telephone calls and promises by the real estate agent later, there is still a long snagging list. (Only a few small things have been fixed by the real estate agent's maintenance man). I now possess my Tapu. How can I get the developer to finish the apartment to the standard he promised? I understand from your mail that this concerns a recently delivered property. In this case you can hold the contractor fully responsible for the not or badly completed jobs to the property in accordance with the purchase agreement. Check that your claims are reasonable and in line with the circumstances. I suggest that you take legal advice. You can of course also contact our office regarding this matter. We are owners of an apartment here in Turkey. We would like to know whether our six children will inherit the property when we die, or whether -according to Turkish law - other relatives are also entitled to a share of this property. We have to review our will in any case upon our return to the UK, but do we have to make separate arrangements here in Turkey regarding the apartment? When you die, your apartment will be left to your children. There is no question that other relatives will inherit your apartment. Your English Will is legitimate in Turkey. You can of course also make a Turkish Will specifically for your Turkish assets. It is not necessary to make a Will if your children are the only beneficiaries, as they are already automatically heirs to your estate. A Will will be made by the notary in the presence of two witnesses. You will also be assisted by a certified translator employed by the notary. Notary fees depend on the number of documents. It will be minimal 400 TL for legal transactions/deeds. The notary will not provide legal advice. If you require specific legal advice, then you will need to contact a lawyer. I have read your article on Tapu amendments. You mention the "form amendment' of the Tapu, the so called 'transfer of the cross'. Does this only apply to apartments? Can you please advise me what the case is with houses (villas)? I own a Tapu (for the plot Arsa), Iskan. The Tapu amendment applies to all properties, regardless of whether they form part of an apartment block, a villa estate or are independent properties. In 2004 we bought an apartment in Mahmutlar without any knowledge of Turkish regulations but with the necessary caution and guarantees, as far as this was possible. 1) We discovered by accident that the house numbers are not in accordance with the land register. The numbering seems to be back to front. What are the consequences, if any, for me the owner when I decide to sell the apartment? 2) Our apartment block has an owner association. The association consists of Dutch, German and Turkish apartment owners. How many owners / what percentage of owners should be present to comply with the minimum voting requirements? What is the majority of votes required from owners present to approve or reject a decision? What are the rules for counting votes if 1 owner has 4 apartments and another has 2 apartments? 3) The annual fee for the association and the joint insurance premium need to be paid into the private bank account of the manager's spouse in the Netherlands. Is this correct? And are there any good reasons not to use a Turkish account which is held by the association and accepts € and TL currency? 4) I think it is clear from the above that we are dissatisfied with the current situation and in particular the repeated threat of fines is detrimental to our happiness in the property. How do we go about replacing the current committee? 1) I am not sure of the potential implications of the problem, but the actual numbering needs to correspond with the numbering on your tapu. If this is not the case, then you will need to take action. This can have far reaching consequences on your ownership rights in the future. 2) The rule is 50% + 1, both for the number of members present as for the number of votes; we call this double majority. And as long as there are no further legal requirements. Counting depends on the total number of apartments. 3) This is completely wrong. The association should have a joint account in Turkey and all members should be able to pay money into this account. It is possible that the Dutch account is used to avoid differences in exchange rate and transfer costs to Turkey. The bookkeeping (if you have a concierge, gardener, etc) should be kept in Turkish currency in respect of the SSK premiums. So, although there are practical reasons for having a Dutch account, it would be more appropriate to have a TL account, so that private money and association money are kept separate. 4) All members have to be present at the meeting. This can be in person or by proxy. A co-owner is allowed to use power of attorney by a maximum 4 other owners. This will allow you to replace the present committee with a majority of votes and elect new members immediately. Last year readers were told about proposed changes to the Apartments Act. One of the most significant changes involves relocating the infamous "cross' on the Tapu or property title deeds. Known as the 'change of form' (cins tahsihi), this has to take place at the Tapu office where all conveyances of land and property are registered. Many owners will already have heard plenty in recent months, despite there being many ongoing uncertainties about the details. Below we present more detail on the subject, including the latest developments. On 28 November 2007 the Apartments Act (Kat müIkiyet Kanunu, statutory instrument number 5711) was amended and supplemented with various articles. The most important change was the obligation on the property owner to have the property (dwelling house, shop, warehouse, etc.) and its kat irtifak (right of use) changed to a dwelling house with kat mülkiyet (apartment ownership). Failure to do this would result in a fine of 1000 TL per property. Owners have to make this change within two years of the new Act coming into effect. The date for compliance was recently extended to 28 November 2009. The requirement to relocate the "cross' only applies to premises for which the Iskan has been obtained. Premises without the Iskan have a lucky escape. The costs of the conversion vary from premises to premises, depending on their individual floor area and the total buildings on the plot. This process involves nothing more than a straightforward administrative change at the Tapu office. The change is aimed at increasing the municipality's and government's tax revenues. After all, the change will put the property in a different tax band, requiring owners to pay more property tax each year. Whilst the rules on change of use had always existed in the Apartments Act, there was no fine for non-compliance. In the last year and a half it has become clear to the legislators that the current regulations involve too much bureaucracy and ambiguity. In particular the Act does not assign clear responsibility for issuing fines, or indeed how and how often it can be done. Nor does the Act provide a facility for separate applications and responses for owners who cannot be contacted. Applications basically have to be submitted simultaneously for all apartments. There is uncertainty about premises without Iskan. It has also become apparent that the period of two years, within which owners have to submit their applications and relevant documentation or be liable to a fine of 1000 TL, is unachievable. Municipalities and Tapu offices alike are unable to cope with the workload. This is why, at the time of writing, the Ministry in question has recommended that the Act be amended. The amendments to the Act include the scrapping of the 1000 TL fine and the Tapu office application fee. The current level of bureaucracy and requisite documentation is also being rationalised. A simple application from the board of the Owners' Association for premises holding an Iskan will be sufficient for the conversion at the Tapu office. The cooperation of all individual apartment owners will no longer be required. The requirement for a DASK insurance policy (mandatory earthquake insurance) for the premises and apartments remains in force. There will also be a facility for municipalities to implement the conversion directly at the Tapu office. 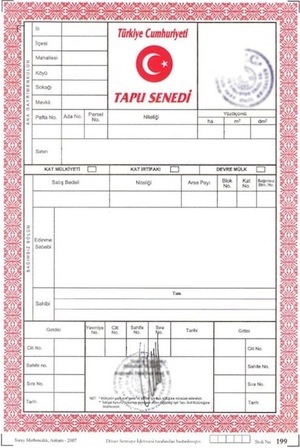 All the Municipality has to do is send the Iskan papers (yapı kullanim Izni) to the Tapu office and the Tapu application should be processed within 60 days. Western European countries operate what is referred to as the buyback guarantee. An estate agent or project developer guarantees a purchaser that they will buy back their property within a specified period, often for the same amount that was paid plus a modest profit. This effectively guarantees the estate agent the sale of a property, whilst the purchaser doesn't have to worry about any potential loss in value. In Turkey such arrangements have no legal standing, despite them being used by estate agents in the sale of (often incomplete) properties. Purchasers/investors buy properties using a buyback guarantee because they believe that at the very least they stand to get their purchase money back, and in the majority of cases with some profit too, as was promised by the estate agent. It's a sad fact that the party making the promise is usually a foreigner too, meaning that the purchaser has no reason to question the worth of the agreement. Besides which, buyback schemes like the one described above have long been reality in Western European countries. Unsuspecting purchasers are oblivious to the fact that it simply isn't so in Turkey. Under Turkish law buyback guarantees aren't worth the paper they're written on. However, this doesn't necessarily mean that the seller involved won't honour the agreement. After all they risk losing their reputation, a prison sentence and, in the event of not possessing a work permit, deportation. Regardless of this, purchasing on the basis of a buyback guarantee can lead to problems later on, as witnessed in my practice. There are some estate agents who, on the specified date, have no, or never had any, intention of buying the property back for the purchase price, let alone for any more. Especially not in difficult economic times, when the entire property market is feeling the pinch. Purchasers get a deafening silence when they request their money back. I can hear the reader thinking to themselves 'surely that's fraud?' Absolutely. The betrayal of a purchaser's confidence is tantamount to fraud. The person acting in the capacity of estate agent or project developer, who made such promises and didn't keep them, can be criminally prosecuted for fraud and deception. This type of situation must not go unpunished, despite the purchaser only really wanting their purchase sum back. Should the selling party fail to honour the guaranty stated in the buyback agreement, a court of law can declare the entire contract of purchase null and void on the basis of 'fraud' and 'deception'. In other words the contract of purchase never existed in law and the transactions can be reversed. The purchaser can reclaim the purchase sum paid and the seller gets the Tapu (title deeds) back, should these have been provided. To avoid such potential disappointment and trauma, I urge purchasers to ensure they only enter into bona fide contracts of purchase or investments by having any proposed purchases reviewed by lawyers.